PodTrans Pro is top-of-the-line iPod transfer software to copy iPod to/from computer, backup and recover iPod to iTunes library, copy songs from iPod to iPod, the most trust-worthy tool to move iTunes library from iPod. 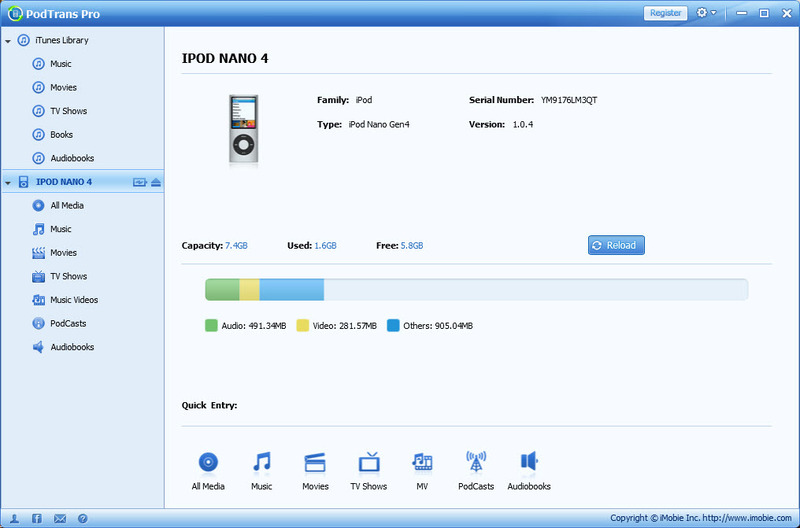 PodTrans Pro is an all-around solution that helps you to create solid backup from iPod to computer; restore iTunes library from iPod; transfer music between iPod and iPod, etc. All for keeping your music collection be safe. ...... reformatted the hard drive. In addition to this, when you need to sync iPod but scruple about erasing formerly saved songs, PodTrans Pro is the way to go. PodTrans Pro also allows you to plug in multiple devices at once and swap the content between them. It's pretty efficient and will save you a lot of time. PodTrans Pro perfectly supports all generations of iPod nano, iPod shuffle and iPod classic. You can choose All-importing and Manual-importing options to add iPod songs into iTunes library, and the repetitive songs will be automatically skipped. When you start typing in the Search Window, PodTrans Pro always results the most relevant outcomes from the library. The more details you type in, the narrower the result goes to. Qweas is providing links to PodTrans Pro 1.0.8 as a courtesy, and makes no representations regarding PodTrans Pro or any other applications or any information related thereto. Any questions, complaints or claims regarding this application PodTrans Pro 1.0.8 must be directed to the appropriate software vendor. You may click the publisher link of PodTrans Pro on the top of this page to get more details about the vendor.